A most unusual bird was spotted on the Strathbogie Tableland recently. Perhaps seeking refuge from the extended drought in northern Australia, a male Scarlet Honeyeater (not the one pictured!) made at least one Boho South garden (on Boundary Hill Rd) its home for a while. Alas, it was gone all too soon, chased from the garden by aggressive Eastern Spinebills. Male Scarlet Honeyeaters are very distinctively coloured and usually residents of the tropics, but they do occasionally stray as far south as Melbourne. There is only one other confirmed record from the Strathbogies, from Maggies La, Ruffy, in 2009, so this is quite a good record. Has anyone else seen one of these striking birds lately? You can learn more about this species on the Birds in Backyards website. I believe I have just photographed one of these birds drinking from a rusty trough in our Merton garden, which I will post on my own FB account. If you want to see the photograph, please advise how to send it to you. Yes, they have been reported in Canberra recently – quite unusual there. They are regular on NSW South Coast, but not inland (e.g., Canberra). 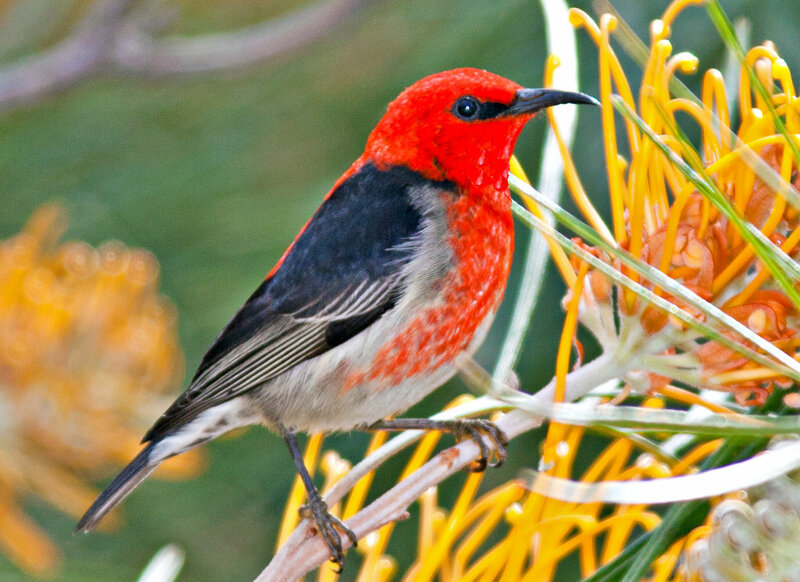 Not lately, and not in the Strathbogies, but we did have a male Scarlet Honeyeater in our garden near Strath Creek in November 2009, and what a spectacular bird it is!